Lobbyist John Walsh’s office is two blocks from the Alaska State Capitol. He said professional lobbyists are basically experts in the workings of government. Filings with the Alaska Public Offices Commission show in 2018 he made $285,500 in lobbying fees. Nearly two-thirds of that came from taxpayer-funded governments or school districts. Walsh represents local governments in Skagway, Bristol Bay and rural school districts off the road system whose challenges may be unfamiliar to lawmakers. “This is a vast state. So just because you’re an elected official doesn’t mean you’ve been to Bristol Bay Borough or to Skagway or to Kaktovik,” he said. Elected lawmakers represent multiple communities in their home districts. “And so they can’t devote direct time per community that they probably wish they could,” Walsh said. But lobbying is about more than just bridging physical distance. 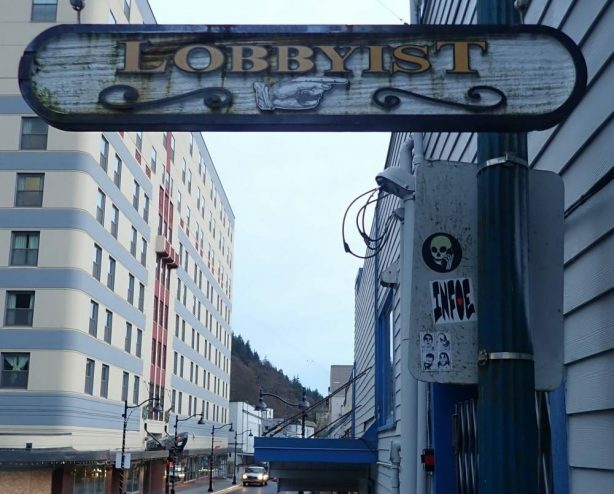 “As far back as I can remember the City and Borough of Juneau has had a private lobbyist,” said Juneau City Manager Rorie Watt. According to Alaska Public Offices Commission filings, Alaska’s capital city paid lobbyist Kevin Jardell $55,000 each year from 2014 to 2018. Boise State University political scientist Jaclyn Kettler said it’s a puzzle for American democracy why local governments do this. Kettler was a co-author of a 2014 paper that tracked a decade of spending on federal lobbyists by nearly 500 cities. Her research found that economically challenged cities were more driven to lobby. The payoff, so the reasoning goes, was their ability to bring money back to their client’s community. Which is what those in the business will tell you. “Obviously you’re on the lookout for funding — that’s always been job one,” said lobbyist Larry Markley. He’s been Sitka’s municipal lobbyist for years. Markley said he’s proud of the work he does for his clients and communities. But what happens when the gravy dries up? In 2017, the state drastically slashed the capital budget that’s available for local projects. Public filings show local governments in Bethel, Yakutat and Haines all dropped their lobbyists. Yakutat City Manager Jon Erickson said it didn’t pencil out to retain lobbyist Ian Fisk, either. But overall, most local governments in Alaska continue to invest in the lobbying sector. For example, Fairbanks North Star Borough continues to pay $100,000 a year for its state lobbyist. Matanuka Susitna Borough has paid its lobbyist $80,400 a year since 2013. Prior to that it had two lobbyists on retainer. In Southeast, local governments in Ketchikan, Petersburg and Wrangell spent about $168,000 combined on the same lobbyist: Raymond Matiashowski, a former cabinet member under Gov. Frank Murkowski. Kettler said she’s skeptical of lobbying’s value for cash-strapped municipalities. But she said it’s really a political question. Walsh, the Juneau-based lobbyist, said cities often need outside funding for infrastructure projects. So they turn to lobbyists like him and he makes their case to lawmakers drawing up the budget. All told, public filings show Alaska cities, boroughs and school districts spent a combined $2,623,976 on state lobbyists in 2018. That number doesn’t include the amount spent on federal lobbying in D.C.
Filings are underway as the the legislature gears up for its 2019 session. Early indicators show that while some localities have trimmed back, most have opted to keep at least one lobbyist under contract.